The rickettsioses constitute a diverse group of arthropod-borne human diseases capable of producing significant morbidity and mortality. They share important pathologic and clinical attributes that permit their diagnosis in most instances (1). The rickettsioses are responsible for a great number of deaths seen particularly in times of war. It is estimated that over 3 million combatants and civilians in the First World War succumbed to epidemic typhus. Among the more deadly types of infection belonging to this group is Rocky Mountain Spotted Fever, the principal subject of this chapter. The rickettsioses are endemic to most areas of the world where contact with arthropods, namely biting ticks, mites, fleas, and lice, can be found. They can be broadly categorized into tick-borne agents that principally include Rocky Mountain Spotted Fever (R. rickettsii) and Meditteranean fevers (R. conorii), mite-borne diseases including rickettsialpox (R. akari) and scrub typhus (Orientia tsutsugamu-shi, formerly R. tsutsugamushi), flea-borne endemic typhus (R. typhi), and louse-borne epidemic thyphus (R. prowaze-kii). 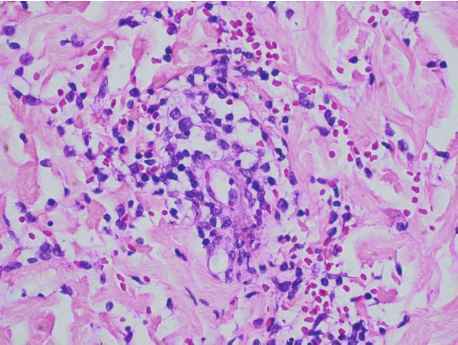 Q fever is unique within the group as its etiologic agent Coxiella burnetti is acquired following aerosolization of infected tissues. They can also be subcategorized into the spotted fever group or the typhus group on the basis of shared immunologic or biologic properties (2). The infectious agents are among the smallest of bacteria at 0.3-10-6 mm. They are considered to be gram-negative and exist as pleomorphic-appearing bodies either exclusive to the cytoplasm of infected cells (typhus group) or the nucleus and cytoplasm (spotted fever group). They require passage via blood-consuming arthropod vectors that use infected mammals and the arthropods themselves as a reservoir. Once introduced into the skin, the organisms attach to endothelial cell membranes until phagocytosed by inflammatory cells with subsequent hematogenous or lymphatic passage throughout the body. Rocky Mountain spotted fever (RMSF) was first described in the late nineteenth century among settlers in the still-wild frontier of the American West, hence the term "Rocky Mountain" fever. RMSF is the most common rickettsial infection reported in North America and though found throughout the continent, is most common in the south Atlantic region of the United States (3). The most important vector for disease is the dog tick or Der-macentor variabilis and the Rocky Mountain wood tick Dermacentor andersonii. The etiologic agent R. rickettsii is transmitted with blood-meals of the infecting ticks, which usually requires at least a 6-hour interval of feeding (4). Most infections occur during the summer and are most commonly seen in children or adult males engaged in outdoor recreational activity. Insect repellants, protective outer garments, periodic tick surveillance, and timely and efficacious extraction of feeding ticks are all important means of disease prevention (5). The clinical manifestations are ushered in by high fever, chills, myalgia, and headache at an average of 7 days following exposure (range 2-14 days). The fever often exceeds 102 degrees and may be accompanied by gastrointestinal complaints (6). The cutaneous manifestation, namely rash, follows within 2 to 4 days after the initial complaints and consists of a macular followed by papular petechial rash (Figure 26.1). The rash initially begins on the wrists and or ankles and spreads to the trunk over the ensuing day. Palm and or sole involvement is fairly uncommon, yet can occur. 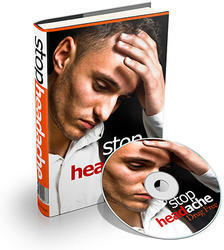 The classic triad of fever, headache, and rash is present in about 60% of patients. A distinct minority (~10%) of patients may never develop rash, so-called spotless fever. 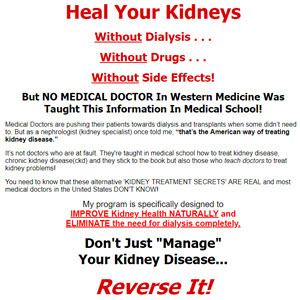 This is most commonly seen in the elderly or among the dark-skinned races. 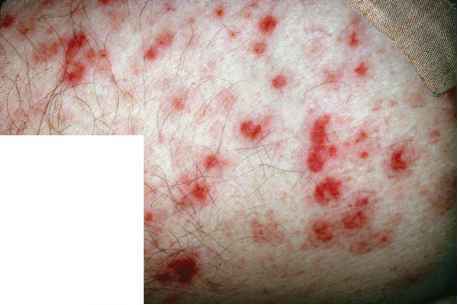 The rash is most often accompanied by systemic manifestations including hypo-volemia, tachycardia, and peripheral edema. Important complications include epidermal necrosis in conjunction with ischemic vascular thrombosis with digital or extremity loss, scarring, and visceral organ failure including hepatic or renal failure, cardiomyopathy with electrical instability, disseminated intravascular coagulation, the adult respiratory distress syndrome, and CNS involvement with delirium or seizure. Motor deficits, cranial nerve palsy, or coma may also be seen. Important laboratory abnormalities routinely encountered in these patients include thrombocytopenia and normochromic normocytic anemia with increased pro-thrombin times and decreased fibrinogen, hyponatremia, hepatic transaminasemia with hyperbilirubinemia, and elevated BUN and creatinine levels. Biopsies from the skin rash show perivascular lymp-hocytic infiltrates with variable degrees of vascular disruption including fibrin deposits and thrombosis (lymphocytic vasculitis), dermal purpura and edema (Figures 26.2-26.4) (7). The overlying epithelium may undergo necrosis in conjunction with ischemic vascular thrombosis. 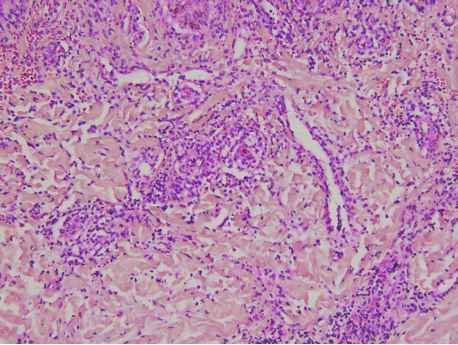 The organisms may be positively identified within the endothelia with the aid of immunohistochemi-cal or immunofluorescent staining (8). Molecular-based methods including in situ PCR have also been utilized but are not widely available (9). Serologic methods remain the most important means of establishing a definitive diagnosis, although they suffer from a delay in diagnosis requiring comparison of acute and convalescent antibody titers. The Weil-Felix and complement-based serologic methods are antiquated due to poor sensitivity (10). Figure 26.1. Maculopapular eruption with petechial hemorrhage in Rocky Mountain Spotted Fever. Figure 26.2. 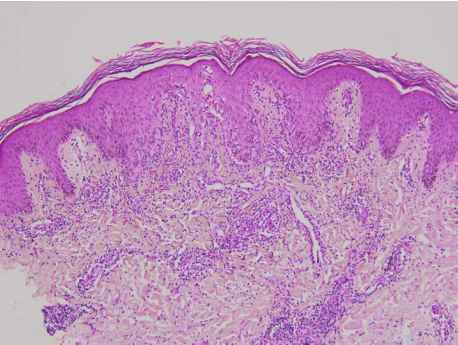 Low power photomicrograph depicting superficial and deep lymphocytic dermatitis with focal epithelial exocytosis. Note the prominent dermal hemorrhage. Figure 26.3. Medium power photomicrograph detailing perivascu-lar lymphocytic infiltrate. Figure 26.4. High power detail with perivascular lymphocytes and erythrocytes. Note fibrin deposits in proximity to the capillaries. rosis termed Fort Bragg or pretibial fever produces a petechial rash confined to the pretibial surfaces. Empiric intravenous antibiotics should be instituted prior to biopsy or serologic confirmation as the untreated mortality approaches 30% (6). Treatment recommendations are tetracycline 25-50 mg/kg q 6 hours or doxycy-cline 1 mg/lb q 12 hours or chloramphenicol 50-75 mg/kg q 6 hours for at least 7 days or until 2 days following resolution of symptoms. Aggressive fluid status and electrolyte balance management is essential. The overall mortality of RMSF is between 2% and 5% with appropriate antibiotic therapy. Most fatalities are observed between the eighth and fifteenth days of illness. Elderly patients and those individuals with coexisting glucose 6-phosphate dehydro-genase deficiency have been reported to have a worse prognosis. Can rocky mountain spotted fever be introduced lice?